Save the planet one step at a time. 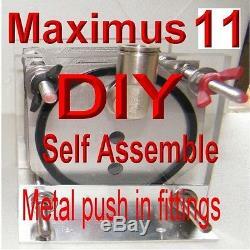 HHO DIY MAXIMUS 11 PLATE DRY CELL BUILD IT YOURSELF QUICK RELEASE GENERATOR. CELL NEEDS TO BE ASSEMBLED ALL PARTS SUPPLIED. This HHO cell comes with big 3/8 (10mm) quick release 90 degree metal swivel fittings to increase flow and up HHO production and to make installation a breeze. The plates are made of 316 stainles steel, as well as all the bolts. The ends are 12mm acrylic with aluminium base mounts. PLEASE NOTE THIS CELL NEEDS TO BE ASSEMBLED. 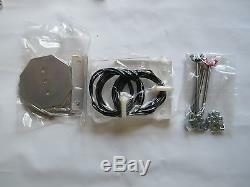 This item comes with a full set of instructions plus all parts needs to make a 11 plate HHO cell. 2 X 100X100 12mm Acylic ends fitted. 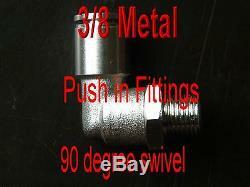 2 x 3/8(10mm) Quick release fittings. 11 X 316 Stainless Steel plate 3 Power 8 Neutral. All the bolts and nuts, washers all in Stainless steel. 2 X aluminium mounting plates. Once connected to the bubbler and vaporizer this Cell is ready to go just add electrolyte and power up! At peak efficiency you can expect this cell to produce suffient HHO at around 10 to 14 amps at 13.2 volts to give sustantial benefit to up to a 2500cc (2.5litre) engine. These HHO dry cells, and for that matter any Hydrogen on demand system added to a vehicle with a stock alternator, run at peak performance at under 20 amps. This is because at over 20 amps the alternator must work harder which in turn causes the engine to work harder, which uses more gas. If more HHO is needed, it is better to add more cells than increase the amperage, as this can often boil the cell which will produce steam and give a false indication of HHO output. IF the question is not answered below please when requsting information give size of engine in cc. Age, make and if diesel or petrol. What are your cells made of? We use only 316L 18 gauge Stainless Steel in all our HHO Generators. The Plates Used in Our Dry Cells Are All Laser Cut, this does have an effect on performance and production of hho gas! 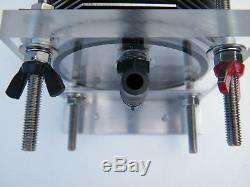 The Acrylic end caps are 100mmX100mm X12mm thick rated at 145 degrees C. The 2 hose barbs are 1/4 The attachment bracket angles are aluminium 2 X 6mm SS wing nuts for easy connection to the power source. Does it make a difference if it is a Petrol or Diesel Engine? HHO will work on both Diesel and Petrol engines Not recommended for engines fitted with an intercooler. 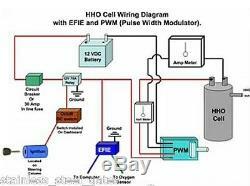 Is a HHO dry cell system hard. T is very simple, All our dry cells and kits have complete detailed installation instructions delivered with them. On average with the right tools and some mechanical know how it should not. Take longer than a few of hours. Can I run my car totally on HHO? HHO is added to your engine and acts as a catalyst to ensure that a greater amount of fuel is burnt rather than thrown out the exhaust or wasted in generating heat and vibration. This in turn increases performance by smoothing out and improving overall operation. Almost immediately you will notice a significant reduction in engine noise, as a more complete combustion helps the engine to cycle correctly, this results in noticeable power increase. Over the next month or so the engine will remove built up carbon deposits from unburnt fuel, further increasing your performance & mileage and reducing your emissions. Fuel savings will depend greatly on the current inefficiency of your cars engine. Some older vehicles can get around 30 to 40% savings. And do I need one? I do if my vehicle is fuel injected and has Emission sensors! I do not if my vehicle is pre computer. Fuel injected vehicles use a computer and sensors to maintain the correct air/fuel ratio. The main sensor is the oxygen sensor. Fuel injected vehicles have one or more oxygen sensors installed in the exhaust stream. The computer takes the information from the sensors and adjust the fuel flow accordingly. Because HHO causes the fuel to burns more efficiently. We must make an adjustment and so we install the. Electronic Fuel Injection Enhancer (EFIE) The Effie tells the emissions computer that all is well. And this allows the engine run at peak. Which EFIE do I need? If your engine is pre computer you need not use an EFIE. A Digital EFIE or a Wideband EFIE. Then we have a dual and quad version of each, and that just corresponds to the number of sensors that you have. Usually V6 and V8 engines need the quad version and 4 cylinder engines use the dual versions. See below for more info on EFIEs. What is the cost of a whole set up? The price of the unit or units is relative to the engine size. Up to 2500 cc one cell will be sufficient, another cell and electrics is need on a bigger size engine. We recommend that each cell is powered independently to shed the power and keep the amps down low. Do I need a PWM (Pulse width modulator)? The pulse width modulator (PWM) has an onboard trim potentiometer to control the amount of RMS voltage and current to your hydrogen booster. Your HHO Generator will run cooler and make more hydrogen which has greater ability to increase fuel mileage. What Maintenance do I do on my Hydrogen on Demand system? Make sure that the engine is off and the Generator is cool before servicing. For extra safety, also remove the fuse to the battery connection before servicing. 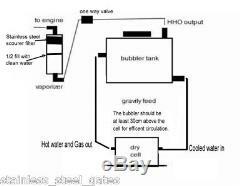 At the same time you will want to check all the hoses and electrical on your complete Hydrogen on Demand system for good connections. Check the water level about every gas fill up, keep it about 1"- 1 1/2" from the lid. Will my HHO cell use much Water? The cells use very little, in fact you could drive many weeks without having to add more. To make the cell perform at it highest level it is important to remember that as the water evaporates the electrolyte becomes stronger which effects HHO production, so we suggest you always top up with distilled water once every week or two to ensure the reservoir is always full. If you average of 3000 kilometres per month, you would use less than 3 litres of distilled in 6 months. Can I mount the cell horizontally (flat)? The cell is designed to be upright with the inlet and outlet at the top to aid with gas and electrolyte flow. You can however assemble the cell with the mounting brackets to the negative side if you have difficulties with mounting straight up and down Usually you will find space in and around the radiator. These "HHO Generators", will produce Hydrogen and Oxygen. Hydrogen is a volatile colourless gas that has a low temperature ignition point. This gas also has no smell. Serious injuries and bodily harm can occur if the device is not handled or used properly! NQ Hybrids takes no responsibility in damage to mechanical or bodily injury! Please, Safety First when dealing with any hydrogen generators. This cell should not be operated without a bubbler or flash back device! ALSO AVAILABLE AT NQ HYBRIDS. Dry Cell kits to suite up to 2.5 litre petrol or diesel engines. To suite up to 5 litre petrol or diesel engines. Pulse Width Modulators for Our HHO Dry Cell System. The PWM HHO Generator Controller Parts Specifications. PWM Unit MX66 Two Transistor PWM 20A RMS 30A MAX 2 Black ABS Plastic Enclosure Size 4.7" x 3.2"x 2.2 with mounting flange 3 Cooling Fan - 60mm x 10mm Ball Bearing Fan 4 Adjustment Knob. Full Installation Instructions come with this HHO pulse width modulator The pulse width modulator (PWM) has an onboard trim potentiometer to control the amount of RMS voltage and current to your hydrogen booster. The PWM pulses at 100 Hz. EFIE (Electronic Fuel Injection Enhancer). Fuel injected vehicles use a computer and sensing devices to sense and maintain the correct air/fuel ratio. One of the key sensing devices is the oxygen sensor. The computer extrapolates what the air/fuel ratio is based on the amount of oxygen in the exhaust, as reported by the oxygen sensor. When Hydrogen on demand device is installed, the petroleum based fuel is burned more completely. One of the results of this is that there is more oxygen (and less unburned hydrocarbons) in the exhaust stream. This is a good thing, and is in fact, what we are trying to achieve. However, the computer will perceive this condition as a "too lean" air/fuel mix. In other words, what is now a desirable condition in the exhaust will be interpreted as "not enough gas", and the computer will direct the fuel injectors to increase the amount of gas being pumped into the engine. The result is that the oxygen sensor and computer prevent efficient combustion from occurring. The Solution The oxygen sensor "tells" the computer what the oxygen content is by providing a voltage on it's signal wire between 0 and 1 volt. 45 volts means that the fuel/air mixture is correct. Higher values means the mix is rich (has too much gas), and lower voltages means the mix is lean. By adding voltage to the sensor's output, we can compensate for the additional oxygen in the exhaust. The Electronic Fuel Injection Enhancer (EFIE) does exactly this. It adds a floating voltage to the top of whatever the oxygen sensor is putting out. It has an adjustment that allows you to control, to within a few millivolts, the amount of this added voltage. This allows the computer to be unaware of the additional oxygen content of the exhaust, and the electrolyzer can now achieve it's full potential in fuel savings. Most cars have oxygen sensors both before and after the catalytic converter. The ones downstream from the converter do not need to be treated. Their data is used to determine when the converter has gone bad, but are not used in the air/fuel calculations. EFIEs are only needed for all upstream oxygen sensors. This is the EFIE for V6 and V8 engines that are equipped with wide band oxygen sensors. Note: Vehicles that use wide band sensors only use them upstream of the catalytic converter. The downstream sensors will still be narrow band. Therefore this product has 2 wide band EFIEs and 2 narrow band EFIEs. This is the EFIE for 4 cylinder engines that are equipped with wide band oxygen sensors, or any vehicle with one wide band and one narrow band sensor. Note: Vehicles that use wide band sensors, only use them upstream of the catalytic converter. The sensors will still be narrow band. 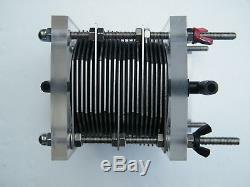 Therefore this product has a wide band EFIE and a narrow band EFIE. The HHO generator wiring has one important necessary feature: its ability to automatically turn on and off the HHO gas generator. Instead of using a toggle switch to operate the HHO system, a relay is installed. A relay is an electrical switch that controls another circuit. It is also a device that contain an electrical winding motor inside which when powered up, will allow connection of 2 wires or circuits together. This is important in our Hydrogen on demand wiring which needs to be shut off when we stop the engine. If we are using a toggle switch to turn the HHO generator on, there is a chance that we can forget to shut the toggle switch off. HHO Is EXPLOSIVE The relay is activated when you turn on the ignition and is turned off accordingly. You can fit a toggle switch in between to deactivate the HHO system as a method of override. ALL NQ HYBRID SYTEMS COME WITH A 30 AMP RELAY. The Bubbler: is a simple flashback device, used to prevent the burning gas from entering the HHO gas generating chamber and creating an explosion. The HHO coming from the cell moves the electrolyte around. ALL NQ HYBRID SYTEMS COME WITH A BUBBLER. Now the installation of your unit should be complete. You are now going to Mix the Catalyst (electrolyte) with Distilled Water. Its common name is caustic potash. Potassium Hydroxide is the best electrolyte for a Hydrogen Generator. The strength of your electrolyte mixture is what controls the amps drawn by your dry cell. To keep my unit running at 18 Amps or less and get a least 1 liter per minute of gas or more Start with 100gms of KOH to 900 gms of distilled water for start up , you may need to add more to get higher amps but run your unit with a weak solution to condition it first. Use "Safety First" rules when mixing KOH or other caustic materials. Mix thoroughly in a separate container. Once this has been mixed add to the reservoir, you should be able to see the water flowing into the dry cell. Bring the level up to the 3/4 mark on the reservoir and make sure to put the cap back on. Should be fully functioning and ready for a test drive. Before you take a test drive start the vehicle, you should now see the water in full circulation. Double check for air and water leaks at this time BY getting a spray bottle and a teaspoon of dish soap once mixed spray on all of your hose connectors, bubbler cap and reservoir cap, if there are bubbles you have a leak and this needs to be fixed. Always read MSDS data sheets when using corrosive / caustic solutions. In no event will nqhybrids be liable for any loss or damage to any vehicle or person including without limitation, indirect or consequential loss or damage, or any loss or damage whatsoever arising from the use of our products. NQ Hybrids recommends a competent person installs there units and the purchaser does does his or hers own research on the use of these exsperimental fuel cells. All our Version SS cells are pre-treated with anti foam agent so you always get off to a good start. All our cells are pressure tested and checked for Continuity. FOR MORE INFORMATION message Us. If the question is not answered below, please give the size of engine in cc. Age, make and if diesel or petrol when requesting information. With this HHO on demand System more of your primary fuel will be completely burned, smoothing out and improving overall operation. You will almost immediately notice a significant reduction in engine noise, as more complete combustion helps the engine to function correctly. For a about one month after HHO is installed the engine will continue to help remove built up carbon deposits which results from the unburnt fuel, This by itself will increase your economy and performance. The Plates Used in Our Dry Cells Are All Laser Cut and cross thatched. This does have an effect on performance and production of HHO gas!! The Acrylic end plates are 12mm thick rated at 145 degrees C. The inlet and outlet treads are1/4 The attachment bracket angles are aluminium 2 X 6mm SS wing nuts for easy connection to the power source. HHO will work on Diesel and Petrol and gas engines. Is a HHO dry cell system hard to install? It is very simple, all our dry cells and kits have complete detailed installation instructions delivered with them. On average with the right tools and some mechanical know how it should not take longer than a few of hours. What size cell do I need? As a rule an 11 plate will do up to a 3 litre engine a 21 plate up to 4.5 litre engine and for the bigger engines up to 6 litre the Brutus 11 plate truck cell. Do I need a PWM? To make the HHO production more efficient the use of a PWM /CCPWM is recommended as control over the amount of amps the cell draws is important and higher pulses increase HHO production. Do I need a EFFIE? Not all engines need an EEFIE. It will depend greatly on the fuel type Diesel or petrol plus the year of manufacture. Please message for more info. Please state year and fuel type. Australia We post via Australia Post. Generally, it takes 1-9 days to deliver parcel within Australia. 5% of the value of the item. If the product is found to be defective, it will be replaced free of charge. We constantly monitor our inbox and will reply to your message within 24 hours. HHO generators designed by the leaders of HHO technology in Australia. HHO manufactures use lower grades of Stainless steel like 304 and just run of the mill bolts and o rings. Here at NQ Hybrids, we only use high quality materials for our HHO generators and parts. NQ Hybrids strives to provide a high quality affordable HHO Generators and HHO Systems with the best possible customer service. The item "HHO DIY MAXIMUS 11 PLATE DRY CELL BUILD IT YOURSELF QUICK RELEASE GENERATOR" is in sale since Thursday, June 30, 2016. 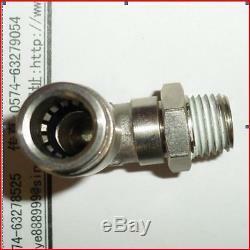 This item is in the category "Vehicle Parts & Accessories\Car & Truck Parts\Air Intake, Fuel Delivery\Other". The seller is "stainless_steel_gates" and is located in Malanda, QLD. This item can be shipped worldwide.